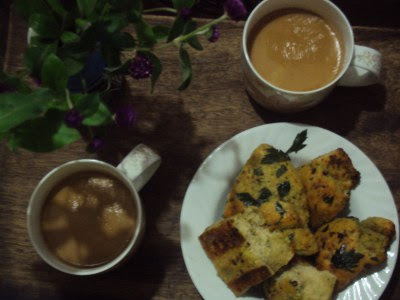 A couple of mugs of green tea during the day and the evening tea is definitely masala chai, the masala being different in different seasons .... and the tea time snack is mostly prepared fresh if we are not having jhaal muri or roasted chana masala .... it can be the crunchy sabudana vadas or rolled up khandvi or a fluffy dhokla . If we feel like having something fried it can be cabbage fritters or daal ke pakode or homemade samose . Sometimes I make some snacks which can be stored in the fridge and just warmed or stir fried with our evening tea, like that soft fara or the patodas or basan ki katli . Cakes and cookies have become very rare although I remember I was on a cakes and cookies land just after our marriage, that explains the weight gain. Thank god I came back to healthy eating, now a days I bake cakes n cookies only if I am expecting kids at home or for gifting somebody. 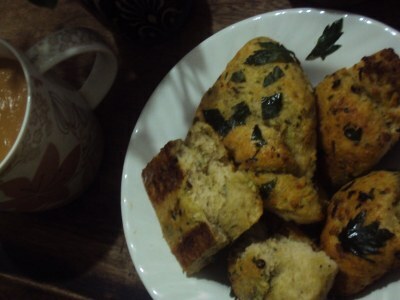 I used some dry rosemary and lots of peppercorns , the scones are yeast scones made without butter or baking powder . I like them better because I am more of a bread person than a cakes and cookies lover. Pulse the chopped celery and black pepper corns in the chopper , now cut paneer in chunks and dunk it into the chopper too. Pulse for a minute so it becomes a coarse granular mixture. I wanted bits of paneer into the scones. Paneer can be grated and the celery finely chopped , most of the black pepper corns will remain whole and a few will be crushed. Add salt and pepper into it and then empty the contents into a mixing bowl. Now place the yeasted bread dough over the paneer mixture and press to flatten . Fold the flattened dough with paneer side in and press it again on the paneer mixture . Keep pressing and folding till all the paneer mixture is incorporated into the layers of bread dough . Bits of paneer keep sticking to the surface of the dough and a few celery leaves can be sprinkled over the surface too. Flatten the dough over a chopping board or any other surface , about 2-3 cm thick , and cut in squares or triangles.Place the pieces on a greased baking surface and let them rise till they double in thickness. Bake in a preheated oven at 250 degree C for 12-15 minutes , or till cooked with a golden brown crust and feels light weight . Brush the surface with butter and cool on wire rack . Best consumed warm, gorgeously buttery taste even though it does not have any butter in it . Paneer makes it soft and brushing with butter makes it even more fragrant ..
Celery is not the most favorite herbs of mine but it tasted really good with hot peppers and paneer , rosemary was a slight hint as it was not fresh . 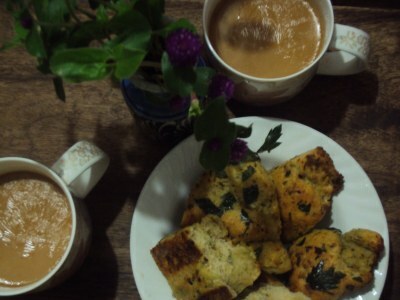 The scones are light with a gorgeous crust and soft pillowy interior , bits of paneer and celery are yummy.... perfect for any kind of milky tea .. The rustic look of these square shaped scones i like , if it is a bit too peppery for you , the quantity of whole pepper corns can be halved . And some more paneer can be added if you want it rich . I saw scones at this tea party and wanted to have some instantly , made my savory version and now this tea is going to The mad tea party . Take a look what she has to say about freedom .... I agree absolutely ..
Never mind , the tea and the scones are great. Have a good time. Have a nice day tomorrow. Thanks Ushnish ... i like your humor . Thanks Gauri and Anukampa i loved the process of making these scones more than the tea this time..
wow, what a tea party. Can I please have those scones. Ooh, these must be great hot out of the oven! You are a tea aficionado like a lot of us here - that cup of masala chai is looking good! Even my masala changes with the weather! such diligence in the kitchen!! my respect.. the photo says all..
Sangeeta these look luscious! I have tpo try this at home.....thanks for the recipe! YUM!! Dreaming of making some soon! !